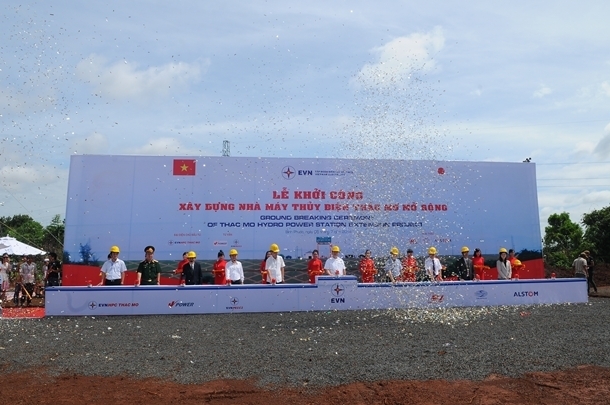 In the morning of July 5th 2014, at Duc Hanh commune, Bu Gia Map District, Binh Phuoc Province, the Thac Mo Hydro Power JSC (Electricity of Vietnam-EVN) held a beginning ceremony on extension project of the Thac Mo Hydro Power Plant (HPP), increasing the capacity of the plant from 150 MW to 225 MW and complementing a 52 million kWh generation per year for the National Power System. Mr. Hoang Trung Hai, Deputy Prime Minister attended the ceremony and ordered to break ground for the project. The image of the Inauguration of Thac Mo HPP Extension Project. EVN as the Investor of Thac Mo HPP Extension Project has assigned to Thac Mo Hydro Power JSC for project implementation under the supervision and direction of the Power Generation Corporation No2 (EVN Genco 2). The project is located on Be river upstream in Bu Gia Map District, Binh Phuoc province, about 170 km from Ho Chi Minh City. The project will use the same basin and reservoir as the existing plant, so it can save rather much investment costs. The total investment cost of the project is VND 1,588 billion, among that 85% comes from Japanese ODA loan and 15% from EVN. The deadline for the project completion is 36 months accounting from the commencement date. So, the project is expected to be completed in July 2017. The main items of the project include: water conducting channel, water intake, shoulder dam, underground penstock, hydro power plant, discharge channel and a feeder cabin on distribution station. Currently, Be river and Dong Nai river basins have a confluence and after Tri An reservoir there are three hydro power cascades including: Thac Mo, Can Don and Srok Phu Mieng. Deputy Prime Minister Hoang Trung Hai is speaking at the Seginning Ceremony. Speaking at the ceremony, Deputy Prime Minister Hoang Trung Hai highly appreciated efforts of the consortium of contractors in process of preparating and beginning construction of the project according to the plan. 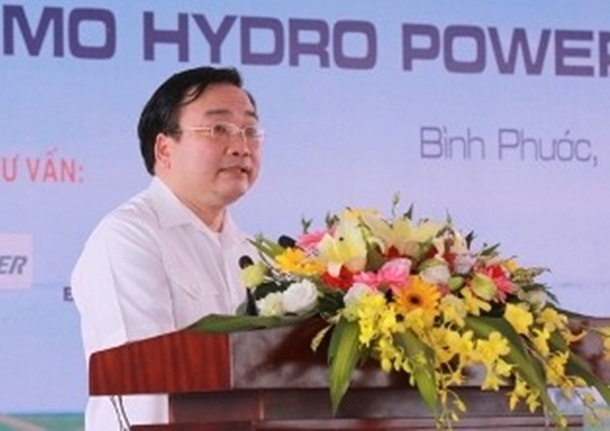 Deputy Prime Minister stressed: "The Extension Project of Thac Mo HPP is an important project of Binh Phuoc province and Southern region. Therefore, in order to complete the project in accordance with the plan, bring into play the efficiency accordance with the design and ensure the quality both on engineering and art, EVN need to coordinate well with the consortium of contractors and the Thac Mo Hydro Power JSC in implementing the project, monitoring quality of the construction and ensuring safety for workers. Binh Phuoc Provincial People’ committee and people at the project area need to create favourable conditions and support contractors in all concerning aspects, especially in construction plan clearance for the project to be completed in time and to bringing into play the efficiency." According to EVN’s report, in order to meet the need of electricity demand for the socio - economic development of the country and daily life of people, in recent years, EVN invested the hundreds of thousands billion VND for the new construction, reconstruction and upgrading the power generation and grid projects with an investment growth rate of over 20% per year. Especially in 2013, EVN already invested VND 104,791 billions - it was the first time that EVN invested over VND 100,000 billions. In 2014, EVN planed to invest VND 123,654 billions. Besides, EVN has constantly striven for supplying the remote, border and island areas by national power grid, and by this way contributed in ensuring people’ living, social welfare and protecting national security. Up to now, the EVN has electrified up to 99.24% of the communes, 97.82% of rural households. This has contributed in changing the face of Vietnamese agriculture, farmer and countryside.